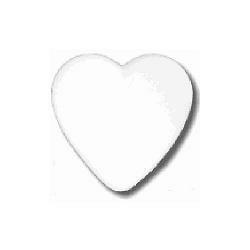 DENSE POLYSTYRENE HEARTS FORM. IT'S MADE FROM VERY DENSE STYROFOAM WHICH IS HARD AND IS THE PERFECT SURFACE....NO PREPARATION NEEDED AND NO MOISTURE ISSUES! WE ARE EXCITED TO BRING YOU THESE WONDERFUL AND UNIQUE POLYSTYRENE FORMS TO MOSAIC. THIS WOULD MAKE A GREAT GARDEN ORNAMENT. LET YOUR IMAGINATION RUN WILD! AVAILABLE IN 3" HALF (FLAT BACK), 3.5" FULL AND 3.5" HALF (FLAT BACK).